Well, it's been quite a while since I have added anything to my lovely little blog. Having a second child will do that to you! I just have not had any space to think of writing regularly. Maybe this won't have changed, but I'm excited about a new project that begs for blogging on California Homesteading. I'm just getting started with a "Straw Bale Garden". After following one of those ubiquitous Facebook links to a page on the subject, I took about 10 minutes to decide to order the $20 book to find out how this is done. I've heard of growing things in bales before, but didn't know much about how. Straw Bale Gardens by Joel Karsten, a Minnesota gardener (http://strawbalegardens.com/), arrived within a few days, and I quickly saw great potential. Our gardens have been in a challenging way for some years. The size had grown large, and required more physical labor to prepare than I have strength and lower back health. We also live on a pasture, and our regular vegetation is grass, lots of it, several species of which are quite invasive, and difficult to remove for spring and summer planting. Our spring planting is often thwarted by wet soils and weather, and in the summer, gophers are a huge issue. 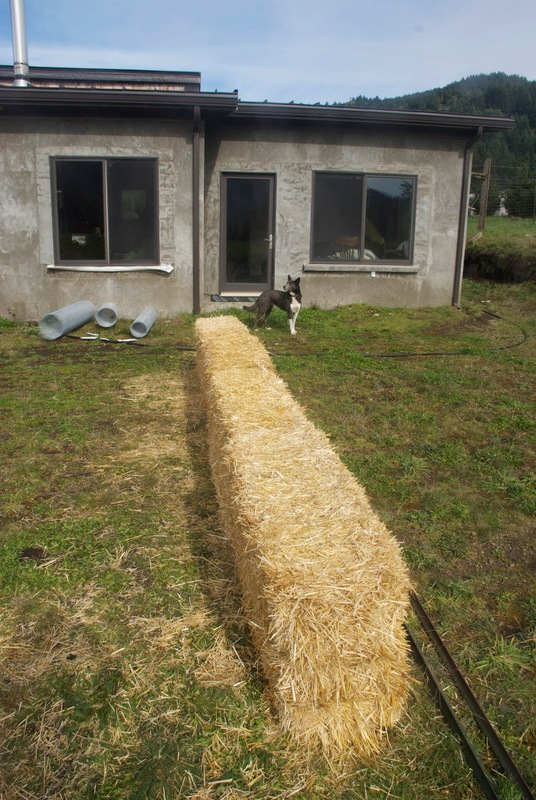 In Straw Bale Gardens, Karsten describes how to add fertilizer and water to a regular old straw bale to transform it into a warm, moist, bacterially-active growing medium, all above the ground at a nice height for working, while also creating a little trellis that you can use to create a mini-greenhouse, warmed by your cooking bale, to protect your young plants. Another added benefit for us is that these beds can be temporary, in that at the end of the season, all that's left is composting straw. We are still deciding what shape and form our garden area right outside our door will be, so the idea that we can create this garden and then tear it down if we hate the layout, is very appealing. So the day after getting the book, Drew was going to town with the truck to get hay for the milk cow, and we also got a few straw bales. He was even able to find organically-grown bales. I procured the necessary amendments and hardware cloth underlayment from our friendly neighborhood nursery, and I started watering and amending them yesterday. Once they're ready, in about two weeks, we'll plant peas, radishes, arugula, and lettuce. Gardner and I also planted lots of seeds that will be ready to transplant into our next round of bales. These will be our regular spring crops that I often can't get in the ground early enough: broccoli, cabbage, cauliflower, bok choi, fennel, cilantro, lettuce, etc. It's almost the new moon, too, which means it will be time to plant the tomatoes, eggplants, and peppers. I'm so excited about our garden after an almost-complete hiatus last summer. The year of grief, after losing three friends in three months, seems to have left me now, and I am motivated again in the good things in life. I have missed eating our own home-grown produce, and am looking forward to piquant and fresh lettuce greens, and delicious fruits, grown perfectly for our tastes. Bon appetit!